Sign up with your email address to receive articles and how-to’s about Digital Marketing. If you browse current articles on startups, it won’t be long before you come across the term ‘Persona’. But just in case you haven’t encountered it yet, here is the brief. But will it? Is using this process really beneficial to your business or is it a fanciful approach using storytelling? Here, I’ll give you my take on what a persona is, why you should care about it and how you can make it work. A persona is a representation of your ideal customer. Businesses tend to use two types of persona: a buyer persona or a user persona, depending on their offering. Creating a persona – or personas, in the case of larger businesses – helps you to relate to your customers and create a better focus for your marketing, sales, products and services. A persona profile is created from multiple levels of information about a specific market. A typical profile represents that information as a fictional identity, and includes details such as the persona’s job, family demographic, a typical day, aspirations, motivations, etc. A larger or more complex business might have several personas, and each might have more aspects than this. By creating this picture of our ideal customers, we can tailor what we produce or do to their specific needs, behaviours and concerns. This knowledge mitigates your risk when you launch your business. It also increases your chances of connecting with a strong and loyal market segment. How do we create a persona for our business? The idea is a simple one, but its execution is a little more involved than it sounds. Here are the steps to take, which involve going right back to basics. 1. What Kind of Market Do You Serve? The first thing to be clear on is the type of market your business will be targeting. Mass Market. You cater for everyone. Niche Market. You target specific customers according to age group, location, interest, etc. These are within a single customer segment. Segmented Market. You target customers with slightly different needs and problems. Your customers come from more than one segment. Diversified Market. You target and serve two customer segments with differing needs and problems. For example, Amazon online retail and Amazon Cloud Computing have different offerings for different customer segments. Multi-Sided Market. You target two or more independent customer segments. For example, Uber targets both taxi drivers and travellers, although these are quite different groups. As you can see, different markets present your business with different numbers of customer segments. Some will have one persona, while others have more. As a startup, your business will not and should not cater to everyone. Your product or service will only begin to appeal to a broader market segment when you evolve your single persona, or create other personas. Within your business’s market, you need to identify and understand your customers before you can satisfy them. This means you need to categorise and label them according to certain traits. Think about it: we do this all the time with people, whether it’s by their appearance, address, sign of the zodiac, or whatever. We need to ask questions about the identifiable traits that our customers share. This means adding more detail to the market segment and customer type you’ve already identified. Analysing your customer and contacts database for trends. Using forms that capture customer information. For example, you can add a field to your email contact form (eg, “How many people do you employ?” in the case of a business customer). Talking directly to your customers in the normal course of business, and assessing the most active buyers and potential buyers. Interviewing by phone or in person to find out more about them and how they feel about your business. The information you extract will vary according to the nature of your business. After a while, you should start to identify the shared group characteristics. BUT – what if you don’t have any customers yet? If you are just starting out and your customer file is at zero, what do you base the persona on? In this case, you start by assuming certain characteristics, and then refining this as you obtain more customers. These assumptions are based on your idea of the ideal customer and will cover the same points as above. The assumptions may not be completely true, but the more you meet people and develop your business, the easier it will be to validate your assumptions and refine this persona to match real customers. It is the same as an artist who sketches out a painting with broad brush strokes, and only gradually adds more and more detail. So, begin with the first conversations. Keep at it, learn more about it, talk to more people, practice more by asking questions, and eventually the picture will be clearer. I start my persona research with defining the job to understand the challenges and motivations. A number of formalised approaches have been developed, including the popular Business Model Generation. 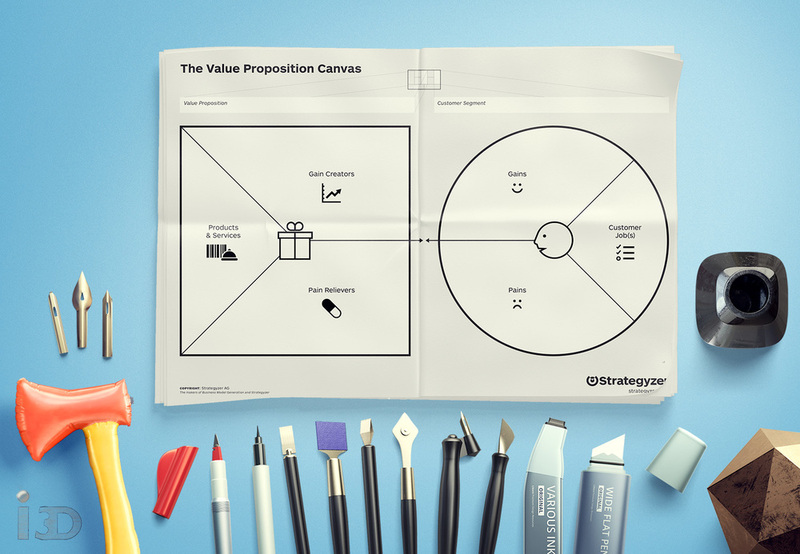 Developed by Alex Osterwalder and Yves Pigneur, this divides your customer profile into Customer Jobs, Customer Pains and Customer Gains. This is where the layering really happens. The persona is based on your ideal customer or user, which will be the type of customer who represents your best sales potential. This type of customer should have characteristics that show up many times in your profiles. The basic persona includes demographic information, such as type and level of job, income group, family status, gender, age, and type of residence. The next step is to add layers. The emerging persona can include more marketing specific details. For examples, identifiers are specific to your marketing needs, and give details such as how the persona prefers to communicate with colleagues, where they get ideas from, and their professional goals and challenges. It’s important to always think of your persona as an individual, rather than a group. Although you may have a number of jobs that fit, you will have to decide upon one. You can find more inspiration with various free online templates that will help you build up a persona, such as this one from Hubspot or you can download the persona development workbook and guide below this article. Be specific about your persona. 5. How Do You Use the Persona? Once you’ve completed the persona, you can use it to develop a more effective conversation with your target market. You will have a greater understanding of who your customers are, where they want to go in life, and the challenges they face in getting there. In short, you can start to build a rapport. A rapport is based on recognition of your customer’s needs, likes, dislikes, challenges, dreams, aspirations, motivations, quirks – everything. It’s a conversation that demonstrates your understanding. What’s more, you’re establishing a rapport with your ideal customer. This is the customer who doesn’t argue, who truly appreciates your product or service, and who keeps coming back. This is the customer who refers you to their own network and helps to build your business. The key is connection. Customers’ emotions may be involved in a buying decision, but they rationalise it mentally. Rapport is instrumental in engaging the emotions as well as reason, in a combination that will lead to a sale. Sign up with your email address to receive articles and how-to’s about Power BI. But – what if I only sell online? You might ask how you can do this with online selling, which isn’t as effective as face-to-face sales. Well, you can gather prospects (your interested buyers) online, before either meeting them face-to-face, or channelling them into a marketing funnel to develop the relationship. Think about your display advertising. A video ad is more effective than a full-blown animated banner, which is more effective than a click-through ad, which in turn is more effective than a graphic image. There is a reason for this, and it’s called connection. Establish this connection and your conversion should become systematic. To sum up: identify your market segment, profile your customers, create a persona and communicate in the persona’s own language. Going through this process will help you to select most effective marketing channels and use your budget more wisely. You’re Workbook is on the way, check your email address shortly.